Last week, I saw a patient in the hospital that our group was following for consult. Though it was my first time to see the patient, she had been in the hospital for almost a month already. A little longer more and they could have named the room to her. Our patient was morbidly obese and had constant difficulty breathing. She was on 10 liters of oxygen continuously, and supposed to wear a CPAP at night for her sleep apnea, though she hates it and not compliant with it. She also had decompensated congestive heart failure, poorly controlled diabetes, and unrelenting seizures. We were unable to discharge her home due to her persistent poor condition. When I entered the patient’s room, she was having breakfast: heaps of bacon strips (I believe it was more than 10 strips), a large serving of scrambled egg, four heavily buttered toast, a good size donut, and 2 small cartons of milk. My jaw dropped in disbelief! How could we allow this in a patient who was already having serious problems, and in the hospital at that? I was tempted to yank the tray away from her. And I did, but just to examine her. She was obviously annoyed that I interrupted her breakfast, or should I say suicidal meal. There was a recent research in the UK that found that about 75% of hospital food has more saturated fat than Big Mac, and 60% of hospital dinners have dangerously high salt levels. It is a fact that our hospital food is so unhealthy, that patients might be safer to be at home than to be in the hospital. I worked in a hospital before in New York city that has a fast food chain in their cafeteria. It was ironic that you can find both McDonald’s and the cardiac cath lab in the same floor of the hospital. So you can eat your fat greasy burger and if you happen to suffer a heart attack, they can just wheel you straight down the hall into the cath lab for your angioplasty. There was a study conducted more than three decades ago that was funded by the National Institute of Health, about feeding a fatty diet, like the regular hospital food, to a group of rhesus monkeys. The monkeys probably had a blast with all the banana milkshake and crispy bacon instead of their normal diet of bananas and occasional insects. 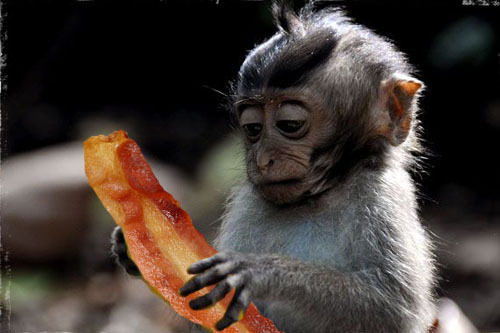 After 16 months of eating the fatty foods, one of the monkeys had a first heart attack. As the study continued, eleven more monkeys had suffered similar heart attacks. This study clearly demonstrated the relation of diet and heart disease. So the take home message from this study for you is if you get hospitalized, don’t stay more than 16 months in the hospital, or it will kill you. Huh? Back to my patient, after seeing her breakfast tray, I quickly reminded her that she was not doing herself a favor by continuing to eat all these high fat foods. Just looking at it gave me a chest pain. However after I walked out of her room and changed her diet to a heart healthy one, I was called by the nurse later on, that the patient simply refused to follow my diet order. She just wanted to eat what she wants to eat. I felt displeased initially, but more saddened afterwards for my patient. She is not an isolated case. Her attitude is the same as the pervading attitude of our society today. We are inundated with advertisement of foods that are rich in fats and sugar, people indulging on the “good life,” and yet our commercials show models with thin and beautiful figures. Somehow there is a great disconnect here. For the health professionals, we practice salvage medicine, where we kind of put a band-aid in a hole on a dam that is about to explode. Somehow advising people to eat the right food and live healthy to prevent diseases becomes secondary. Besides we can always prescribe Lipitor for their high cholesterol and give them insulin injection for their diabetes. It is good for the business and for the pharmaceutical companies, right? In our society we are conditioned and deemed it acceptable to crack the chest open to do the coronary bypass surgery for a heart disease, or whack out or staple a part of the stomach for gastric bypass procedure to help patient lose weight as mainstream medical practice. Yet telling patients to adhere to a lifestyle change like converting to a vegetarian or vegan diet to reverse their disease, is considered too extreme and radical. About the monkey studies again, part of the study was switching back their diet to low-fat diet, perhaps back to their normal food of bananas and other fruits. I am not sure if the monkeys protested, as they got used to the hamburger, fries and milkshakes. But what it showed is that with the healthy low-fat diet, there was a regression of the cholesterol build-up (atherosclerosis) in their arteries – proving that fatty diet can cause the disease and switching to a healthy diet will reverse the disease. We know we can do something for atherosclerosis or hardened arteries. But can we do something for hardened attitudes? Now, if I could also curb my cravings for a Whopper…….